My goodness! Is that Guinness? Bloody hell, another massive let-down. This place would have been my most regular haunt back in my 20’s & I have had many a great night on the perfect creamy pints in this place so I come to the table with the utmost of respect for the pintability here. Having had an absolutely brutal pint here when I was practically the only person in the pub back in April before the league final, I wanted to give them another chance in the hope that the experience was a one-off: how wrong I was. Lets start with the basics; the pint of Guinness is €4.90: total blaydin rip! A bad start, but if the pint is going to be up-to-standard then I can let it slide. Sadly, & it genuinely breaks my heart to have to admit it, the pints in here are far from up-to-standard. 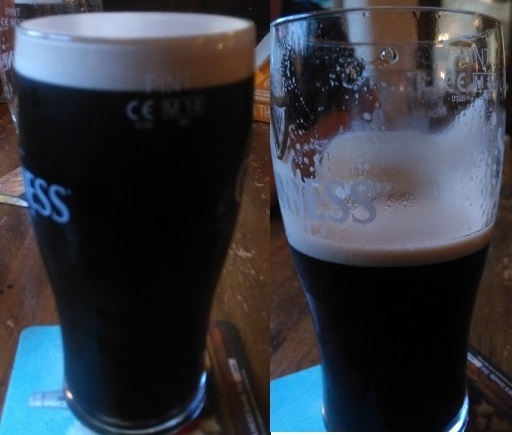 As you can see from the pint-pic, the head has already flattened out before I’ve even had my first sup. A good quality creamy head should be blubbering over, ready to burst into your gob at the sniff-o-the-lip. This pint was saying to me “I’m going to let you down” & a Guinness head tells no lies. When the black stuff hit my palette it was like chewing on a gone-off lemon: full on squinty-wince-face. Gutted I was. As you can see from above, we had hit pencil-tache territory after a few gulps &, though I’m not sure if it’s that obvious from the pic, the tache-head was foamy, rather than creamy; an absolute disgrace when it comes to a pint of the good stuff. Like any good food critic, I soldiered on through but there was no pleasure in the final gulp, nor redemption in the next pint. The Celt: why have you forsaken us so? It could be the curse of the Tripadvisor, as seems to be happening down at The Cobblestone, or maybe publicans just don’t care about punters any more but this place has a long way to go if it ever wants to get back the lofty heights of those heady days when certified 4/4’s were rolling out night after night.